Of all the suburbs, it is the southern ones that seem to have the highest density of Latin eateries, and the number is growing. Andale is one of the latest additions to the scene, having shown up recently on the corner of Nicollet and 77th street and like many of the developments around, it is shiny and new. 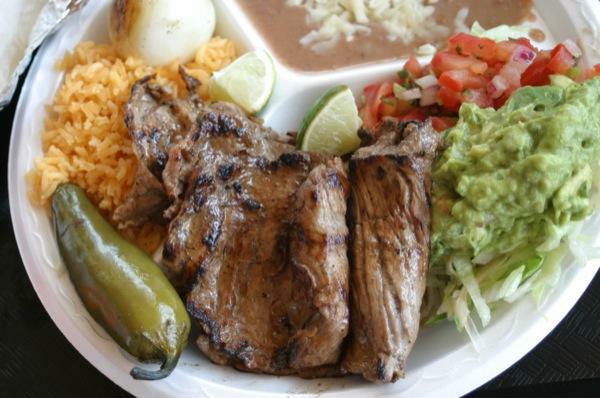 If you have read many of our Latin Tongue posts, you will know that to us, Taqueria is synonymous with small, family, simple. It is therefore, quite the surprise when you come across a shiny new taqueria with branding and all that pizazz. The place, at noon, was jumping...we could not wait to dig in and check this place out. Right away, I saw all of the predictable fare: quesadillas, tacos, burritos, alambres and tortas. Heck, you know me. I was searching for the unknown, the unique, the especialidads de la casa. I found one handwritten sign on the register for alambres that were not typically on the menu, but that wasn't the ticket. I was drawn to a couple of items listed under the tacos. The had carnitas made from slow roasted pork shoulder that sounded amazing, but when I saw the carnitas en adobo I was sold. The other saucy selection I wanted to try was the barbacoa de res. 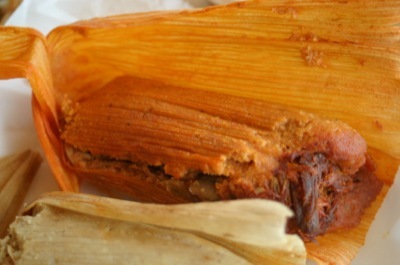 I asked about tamales, despite not seeing them anywhere on the menu and, Success! The had chicken, pork and supposedly jalapeno. More about that later. 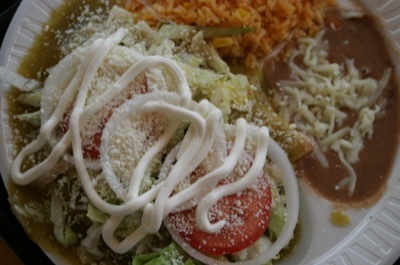 My compatriots ordered the enchiladas verdes and the carne asada platillo. Despite being busy, the food came out quite quickly. The first thing I noticed were the tamales. They were huge, double the size of any other tamale I had ever had. I also noticed that although I thought I had ordered a pork and a raja (jalapeno tamal) I indeed had one with pork and one with chicken. Oh well, eat on I say and take what life gives you. And give it did. I thought the tamales were quite good. As a matter of fact, the masa corn was amazing. 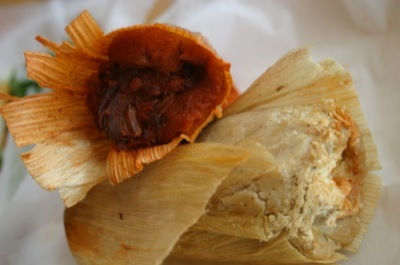 Deep red for the pork tamale, moist and creamy, yet solid and well seasoned. They held together amazingly well, which I love. The meat itself was not as tender as the carnitas, but was still quite tasty. The chicken tamale was also excellent, it being the traditional pale green sauce with a lighter, less spicy taste. I may have liked it even more, especially when I brought some of it home and fried sliced of it to eat with my eggs and potatoes the next morning. Wow! My main recommendation is to either order just one or to order them as a meal. A side of chips and guacamole would be plenty with two of Andale's tamales. Un taco con carnitas en adoboThe tacos with the carnitas en adobo and the barbacoa came looking like they might make a mess of me. They were a couple of the wettest tacos I had ever seen and I must admit I was a bit concerned. One bite cured me. Truly the carnitas in adobo was one of the best saucy meats that I have tasted to date. I'm not even sure if I can identify what it was that made this sauce so tasty. It had some aromatic qualities and was smoky, a bit hot, sweet. Every bite seemed to make me want more, especially with that amazingly tender pork shoulder. The barbacoa was a fascinating balance. It too was excellent, but instead of sweet and smoky like the carnitas, the guajillo sauce of the barbacoa was tart and tangy. The meat itself was also stewed down to the tenderness that comes from slow cooking. I would defintely want one or both of these again, but perhaps in platillo form. They would certainly be easier to handle. Speaking of the platillos, I really appreciated the way that Andale set these up. They came loaded with beans, rice, grilled jalapeno and onion, pico de gallo and guacamole (pictured at top).They were so generous and complete, especially with that whole grilled onion and jalapeno. The carne asada was as it should be. Sliced very thin and not overcooked, it had a good balance of char and was great with all of the fixings and a good dose of lime over it all. This makes for an easy favorite for many. Yum. Enchiladas verdesFinally, we come to the enchiladas. I think by the time I got to these, my tastebuds were a bit overstimulated, so perhaps take the next part with a grain of salt. Also note, that I almost never order enchiladas with beef, so that was probably another gaffe. Overall, the verde sauce was quite good. It fell somewhere in the middle of the many we have had. Not too sour, not overly spicy or savory...it was just good verde. The beef was carne asada, chopped small, and there was lots of it, which took away from my ability to enjoy the sauce and I eat enchiladas primarily for the sauce. Everything else is auxillary. To note--mostly to myself--I will order these again, filled with beans or chicken and cheese. I also promise to try their mole. 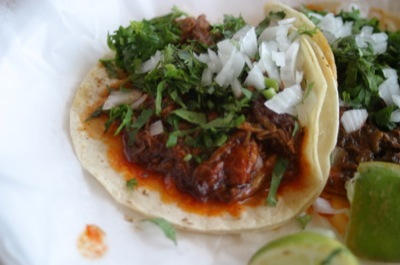 Un taco con barbacoa de res.Overall, it was a great beginning to a new relationship, once which I'm sure will grow. How, you ask? Well, by trying new things and learning what we can about each other. 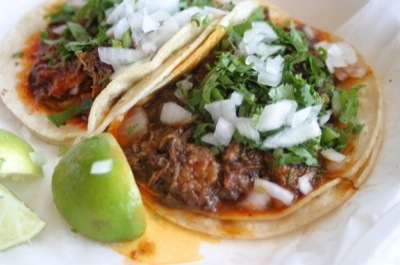 First, I definitely want to try some of their more standard tacos, such as the lengua, cabeza, tripas, cecina, carnitas, etc. I also really want to try both of the tacos I had in the form of a platillo, the carnitas en adobo and the barbacoa de res. Of course I would come back to grab some tamales (especially rajas if they actually have them) whenever I am in the area, simply because they are the best deal around for $2.50 and pretty good hand food. Tortas...I hope someone lets me know if these are any good, because there are 17 varieties!! Finally, there were signs everywhere proclaiming that they had breakfast. Probably not a bad option, especially when you consider other breakfast options in the area. Surprise: Shiny! Plus the large variety of meats and tortas. I am surprised that this place isn't called Andale Tortas. Language: Fairly good, but not much conversation here is needed. Numbers are actually read in English, and the menu is super easy to navigate. Lawrence Black is a writer and editor at Simple, Good and Tasty. He can be reached at lawrence@simplegoodandtasty.com. Despite the heat of summer, he continues to eat large quantities of spicy things...and without beer (a true daredevil). 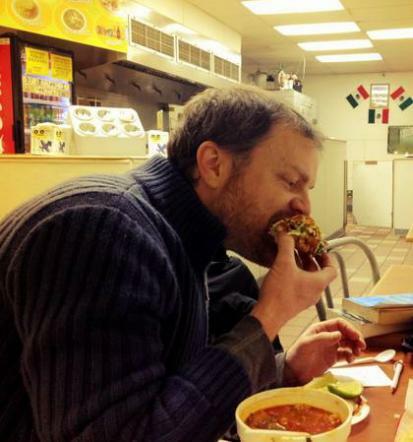 Our last Latin Tongue review was: Marissa's Deli.